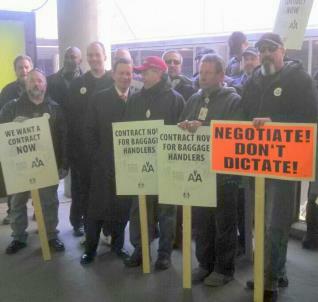 Massachusetts Treasurer Receiver-General and candidate for governor Steve Grossman (second from left, front) and TWU members join IAM members’ informational picket at Boston’s Logan Airport. IAM-represented ground workers at US Airways conducted informational pickets across the country to protest the carrier’s insistence that they accept second-class status and agree to lower wage rates than other employees at the “new” American Airlines who perform the exact same work. IAM members were joined by Transport Workers Union (TWU) members who perform similar jobs at pre-merger American Airlines. They informed passengers about the dire and deteriorating state of labor relations at the airline. “[‘New’ American Airlines CEO] Doug Parker wants the flying public, shareholders, Wall Street and anyone else who will listen that all is going well with the merger of US Airways and American Airlines, and that is simply not true,” said IAM District 141 President Rich Delaney. IAM-represented ground workers have been in negotiations with US Airways for almost three years and requested a release from mediated talk from the National Mediation Board (NMB) last year. The IAM and TWU alliance represents over 30,000 ground workers at the ‘new’ American and is the largest union at the airline.